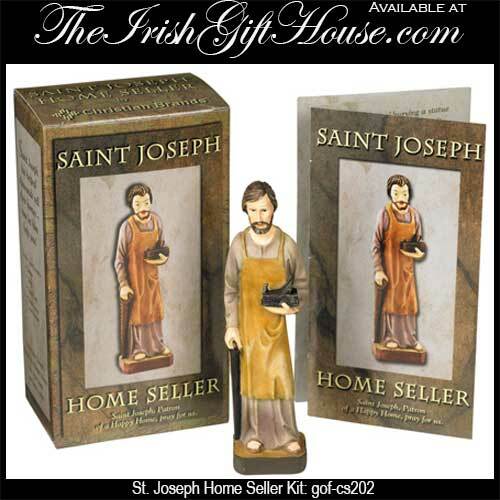 Saint Joseph home seller kit includes a 5" tall statue. The tradition of burying a statue of Saint Joseph finds its roots in the ancient Catholic custom of burying blessed medals in the ground, invoking God’s blessing on the area. It is not the medal, but the blessing, which brings God’s power. In 18th Century Europe, communities of nuns would ask Saint Joseph’s help to find land for their convents. They would bury a medal of Saint Joseph and ask for his blessing. As the testimonies of God’s favor through Saint Joseph spread, the custom changed from burying medals to burying statues. Today homeowner’s of denominations ask Saint Joseph’s help in selling and buying their homes. There are many documented cases of his powerful intercession. Just as Mary and Jesus looked to Joseph for provision, strength, and guidance in his role as husband and father, so we encourage you to look to Saint Joseph for help in the sale of your property and home. The Saint Joseph home seller kit contains one 5" tall resin statue along with a full color story card and a full-color tear-off Saint Joseph holy card with prayer. Saint Joseph is the patron of a happy home.